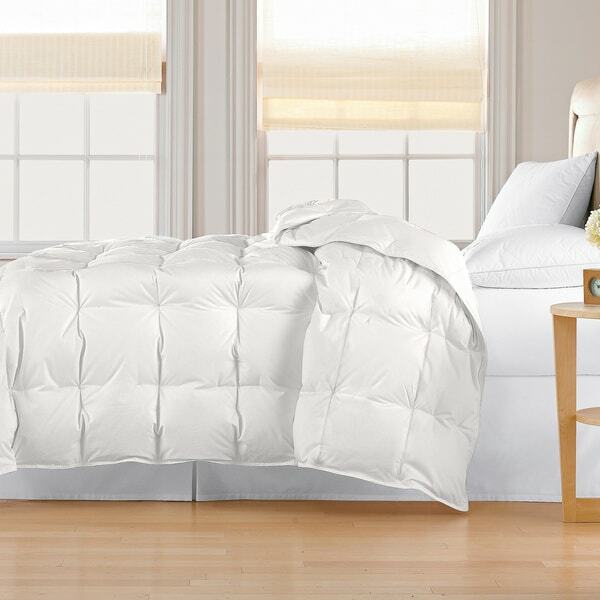 Keep warm all year long with this sleek cotton comforter, filled with genuine down. The white cover features baffle-box construction with 10-inch squares to keep the down evenly distributed while you sleep. Choose from three lightweight sizes to perfectly suit your mattress. I read the reviews before I bought this and everyone said that it was very thin. I guess I didn't know how thin they were talking. This is the thinnest down comforter I've ever seen. Like, half an inch thick-MAYBE. However, I really like it. I put it on my bed right when we got it... I can't believe how warm it is! This paired with flannel sheets is more than warm enough I dont think I will being using a "winter down". With an aim toward lowering energy cost this winter, I shopped for a quality, lighter-weight down comforter that would enable me to lower my thermostat and still stay warm throughout the cold winter months as I watch television or read in the living room. I love this comforter as it meets every expectation I had! Its 233 thread count, 100% cotton cover has a 10-inch box stitch construction which keeps the down evenly spaced and, with 25 ounces of pure white down (Full/Queen size), the 525-fill power is fantastic for such a light-weight comforter! My plan is to use this comforter to replace my heavier (winter-weight) down comforter on my bed in the warmer months. Very saftisfied with the quality for the price I paid! My husband says it's perfect, he tends to get very warm as he sleeps, and this comforter is the perfect temp for him. I could use a little bit more warmth, so I add a light blanket to my side. Come summer, though, this will be the only comforter on the bed. We live in a maritime climate, so the warmest night here would be 60 degrees. The comforter covers the mattress well, if you're looking for a king that covers the box base also, choose another of larger dimensions. If a down comforter of good quality that isn't overly warm is what you're looking for, this is the one. I have owned this comforter for two months now. This comforter is stitched well, no flying feathers, and is soft. The color is white not ivory. The weight is what I would call light. It will be good for year around use, and is more of what I would call a down blanket rather than a big puffy comforter. If you are looking for a lightweight comforter for cooler nights, this will do the job. I purchased the king size and it is not large enough to hang down several inches on the sides of the bed. but it does cover the top of the bed with a few inches to spare. It's a good value for the price and perfect for warmer climates. Not washable, dry clean only. I purchased this down comforter for my teen-aged daughter, and she could not be happier with the product. It has the appearance and feel of a more expensive comforter and is the perfect weight for our southern Ohio climate. The full/queen size fit perfectly into a duvet cover which came from a different company. I was also impressed with the quick shipping (just standard--nothing special) and the fact that the comforter was wrapped in plastice to protect it from the elements. (This measure was tested as the box sat for a few hours on our porch in the rain. The box was partially soaked, but the comforter was perfect!) This down comforter is very nice quality--at a very comfortable price. I have been researching a down (alternative ok) comforter for almost a year now. I was looking for one that is lightweight (since I live year-round in Florida) and has all sewn sections (to help keep the materials in tact). I read all the reviews and decided on this one. GREAT CHOICE! It is exactly what I was looking for ... warm, soft, cuddly, lightweight and just plain perfect for this climate (of course, we keep the air conditioning running 24/7). Although it is dry clean only, I am confident that keeping it inside the duvet cover I also bought (full/queen) the comforter will stay fresh. As for the packing smell? I opened it up, fluffed it, spread it outside for an hour, refluffed and put it on my bed inside the duvet. No smell and VOILA! Perfect Price, Great product! Partner and i love it. We find it hard getting out of bed from being so darn comfortable with this on us! Being in South Florida I have been weary of buying one due to being afraid with the heat. This thing is great with the AC cool @ night like I like. Now I just need to find the right duvet covers! :) Shipping took a bit but I think because it came from CA. I was very pleased to find that this comforter is every bit as warm as some heavier comforters I've owned but without the weight. It came packaged so compactly that I couldn't imagine how it would provide any warmth at all, but it fluffed up beautifully after only a day or two out of its package and had absolutely no odor, as some down products do. The fabric is soft and attractive but, because I choose to leave the comforter folded at the foot of the bed rather than under the quilt, I covered it with an Egyptian cotton duvet. Stunning! Adds a richness to the bed's appearance and, on these already very cold nights, looks most inviting. Great value for the dollar. I highly recommend this product. Give it time.....& its great!! You have to give this blanket time to puffy up. When it first arrived I was very disappointed with how thin it was, it looked like 2 thin sheets. After 3 days it puffed up and it¿s very warm. It is not as puffy as it looks in the picture. This is a great down blanket and you can¿t beat the price! I've been needing a new comforter for a while now, so I decided to buy one from overstock since the prices are always so reasonable. A few of the reviews said that this was more of a "down blanket" since it wasn't fluffy enough, and when it first came in the mail. i admit it was a little anticlimactic. BUT, I tossed it in the dryer with a few tennis balls for 15 minutes and it came out soft and huge and fluffy. LOVE IT. It's pretty, too. Very elegant looking and perfect by itself with a few throws draped over the end. Very warm, not too heavy, and i haven't noticed any down leaking as of yet. VERY happy with this comforter. This comforter has one MAJOR problem. The outer shell which is advertised as 100% cotton has some kind of plastic coating on the inside. It rustle, is stiff and simply not what one wants if they expect a 100% cotton shell. There are numerous complaints and feedback to Overstock and yet they continue to advertise this product incorrectly. I would not have paid the advertised price for a non-all cotton shell. I have previously purchased other comforters and am very happy with them. I ordered this to replace a ten year old down comforter that I felt had lost it's loft. After recieving this comforter I decided that my ten year comforter isn't so bad after all. I feel like I should have listened to the few negative reviews instead of trusting all the positive ones. The fabric is so noisy and it is an extremely thin comforter. Some people said they put this thing right on their bed without a cover..... I can't even imgaine how someone could do that. It's not even pretty. It looks and sounds like one of those white mailing envelopes. I live in Florida and a lot of people from Florida gave it a great review. It's not even summer yet and this think is WAY too hot. As a Floridian I think I may be able to stand sleeping under this thing 10 nights out of the year. I sent it back, gave my old one a good wash and dry and now I'm a happy camper again. Exactly as described. If you're looking for a lightweight all-season comforter, I would highly recommend this item. We've had it for two years and continue to be pleased with it. Seems like a good quality product for the price. Love this down comforter. Lightweight buts adds incredible warmth without the bulk. Easy and light to shake out and fluff up. Would buy again. Beautiful - just what I was looking for! I love this lightweight comforter. I use it all year. Lightweight warmth and comfort. Washes up well and bounces back, even the king size. More like a down blanket weight, but very cozy for my taste and heat level. "is this comforter 100% down. Or is there a % of it feathers"
I am sure it has some feathers as pure down is generally outrageously expensive. However, I feel no "poking" feathers or anything like that. It is very warm and comfy. "what is the fill power of this down comforter?" I don't know the fill power of this down comforter, however I don't feel any feathers poking through and it is light, but warm and comfortable. A great value. I'm very happy with the three I purchased for our home...and so are our guests! "What is the down filling?" Huh?? Down is down, like feathers from a goose !!!! This is a very nice comforter. All the specs are in the description on the website. Overstock stands by its products and this is a nice lightweight quilt. "Does this comforter have ties to attach to a duvet cover?" No it doesn't. You must find a duvet cover that has the strings attached in it already. "What is the size of the squares?" I don't have the comforter in front of me but I want to say like 10 x10. "I am looking for a white comforter similar to ones used in hotels. I like the flat cotton feel, not the slippery feel. I like this one because it says it is lightweight, but need to know if the cover is a true cotton, and not a silky microfiber?" Yes. It is a nice cottony feel. I know what you mean about slippery feel. This is a lovely cotton cover and we are very pleased with this comforter in every way. "I just wondering if the cover is 100% cotton? What % of White Down in it and if it sterilized? If all material is a new? Where this comforter is made? Thank you!" Don't know if it is all cotton, but it feels that way. Also don't know the percent of down, but it is not as soft as more expensive I have bought. It makes a lot of crinkly noise, so needs to be in a cover. My husband says it is too warm for him. Yes it is cotton, but it is not puffy as a down comforter usuallyis.